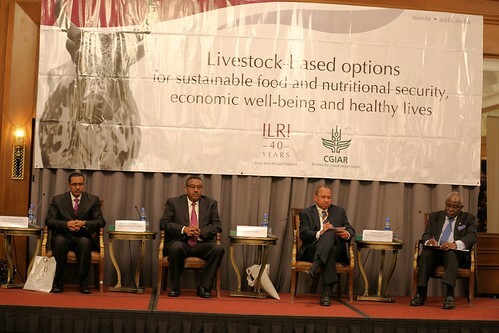 HE Teferra Derebew, minister of agriculture, Ethiopia; HE Demeke Mekonnen, deputy prime minister of Ethiopia; Jimmy Smith, director general of ILRI and Kanayo Nwanze, president of the International Fund for Agricultural Development, at the ILRI40 conference in Addis Ababa, Ethiopia on 6 Nov 2014 (photo credit: ILRI/Apollo Habtamu). Jimmy Smith, director general of the International Livestock Research Institute (ILRI), was recently interviewed by Ethiopian Broadcasting Corporation (EBC) television journalist Tefera Gedamu, who asked Smith about ILRI’s 40-year anniversary. ILRI has a large campus in the Ethiopian capital, where it has been present for four decades (two decades as ILRI and another two decades before that as its predecessor, the International Livestock Centre for Africa, ILCA). In the interview, Smith gives a brief history of ILRI, talks about the institute’s research scope and explains how livestock research improves people’s lives and livelihoods. According to Smith, one of the most important challenges for these small producers is how to deal with animal diseases. In response to this, ILRI carries out research in animal vaccines to control some of these diseases. ILRI also helps smallholders become better connected to markets so they can sell their products and it works to improve fodder crops so the farmers can feed their livestock better. Most of ILRI’s research is translated to the grassroots by national research organizations, NGOs and other institutions that ILRI partners with to move research into impact. ‘We work on strategic areas of the research portfolio where the national research organizations may not have capacities, for example in areas such as laboratory research in animal genomics,’ says Smith. In Ethiopia, ILRI is working with the Ethiopian Institute for Agricultural Research (EIAR) in livestock research priorities identified by the Ethiopian government to add value to their work. But, Smith admits, success in translating ILRI’s findings for those who need them most is ‘uneven’ across countries and depends greatly on national organizations. ‘The most important vehicle in achieving our goals is our engagement with the national, government and non-state actors who are working on livestock development,’ says Smith. These engagements include building the capacity of research students in partnership with the universities of developing countries. He says ILRI’s research is addressing challenges facing livestock keepers across the developing world, such as livestock’s role in climate change, water and land use, as well as the effects of these on livestock production. Smith concludes by saying that scientific research will remain crucial in enabling the agricultural sector respond to the food demands of a growing world population. Watch the whole 20-min interview of Jimmy Smith at meet EBC with Tefera Gedamu. Tags: Ethiopia Broadcasting Corporation, Jimmy Smith. Bookmark the permalink.